Yesterday, MEDA hosted events for 225 job seekers and 34 Business Development program graduates, plus over 40 volunteers, funders and donors. Workforce Development took their job placement magic down the road, with a successful job fair at Valencia Gardens that showcased a queue out the door at the start of the event and 18 employers waiting to meet their potential employees. Business Development celebrated with a graduation party potluck for 34 budding entrepreneurs, many of whom will start microbusinesses and create jobs for the local community. To top it all off, 15 MEDA staff donned their Sunday best on a Thursday to greet the nonprofit’s myriad sponsors, donors and volunteers. The invitees included representatives from various city agencies, banks and tech companies. MEDA’s Mission neighborhood center, Plaza Adelante, never looked better as it was ready to host this “Supporter Acknowledgement” event. Catering was provided by a client from MEDA’s Business Development program, Fusion Peruvian Grill, with tasty chicken, beef, shrimp and yucca dishes to tantalize the tastebuds. The 40 attendees mingled and shared their role in MEDA’s work, while hearing of the past year’s successes and exchanging ideas on best practices for the future. 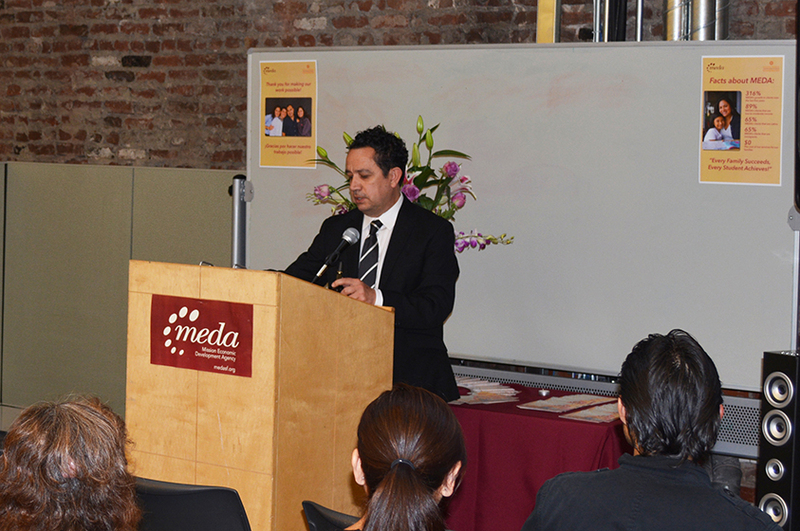 MEDA’s Executive Director, Luis Granados, took to the podium to remind the gathering that MEDA’s work to help the Bay Area’s low- and moderate-income residents would not be possible without their support. 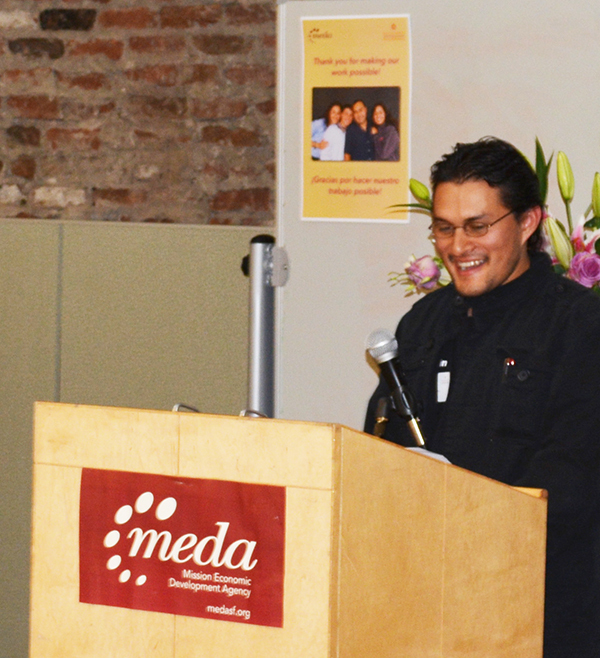 During MEDA’s program, two clients shared their story of how the support of those gathered had changed their lives. First up was Alejandra, who moved to the U.S. 20 years ago in search of a new life. After years of working in restaurants, she felt ready to open her own coffee shop. Searching for a place to help her realize this dream, Alejandra came to MEDA in 2012 and graduated from the nonprofit’s free Business Development program. She then received one-on-one counseling from Business Development Coach Jim Escobedo, who guided her through the steps of making her business dream a reality. The result? Un Cafecito, a thriving coffee shop in downtown San Francisco, located in MEDA’s second microbusiness incubator, El Mercadito-Tenderloin. She’s now hiring from the local community to help grow the business. “Jim Escodebo was a terrific coach. Without him, I could not have opened my business,” explained Alejandra. Another client success story was that of Edwin. Growing up in El Salvador, he always had a love of computers and even tried to build his own from spare parts of older computers. Moving to the United States at 18, he wanted a job in the technology sector, but he didn’t know where to begin. Edwin put his dream on hold for four years . . . until a friend advised him to come to Plaza Adelante. It was there that Edwin met Technology Training Coordinator Leo Sosa, who enrolled the young man in the free “Mission Techies” program, where financially challenged youths, ages 17 to 24, are put on the path to an IT career. Edwin spoke of how he has used his newly acquired knowledge to refurbish 25 Mission residents’ computers–a giveback program that is an essential part of the Mission Techies program. Upon completion of the eight-week course, Sosa connected Edwin with Jones It Consulting, where a interview was scheduled. Edwin’s story and talents so impressed the Jones IT team that he was offered a paid internship. “I am going work hard, so that they will hire me after those two months. And, eventually, I want to have my own IT business,” the budding entrepreneur enthusiastically told the touched crowd. One MEDA volunteer from the tech world later stated how she had been to similar events, but had never heard such impactful client stories. She was glad to finally hear of results of volunteerism and funding.